Thank you to Around the World ARC tours for the book! 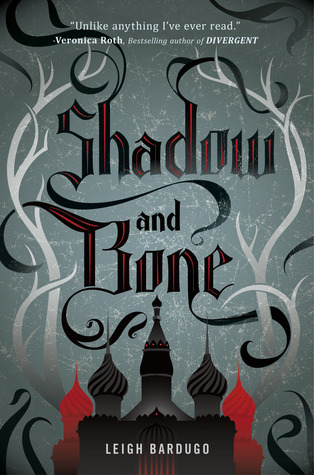 Shadow and Bone is a story that takes off from page one. We meet a boy and a girl in an orphanage, trying to survive. The friendship between the two is evident and beautiful from the start. Then, we are transported to present time and the boy and girl are now on a journey across the darkest part of the land. They are ambushed and are battling for their lives, when Mal, her best friend and the love of her life, is injured. Alina, who is not a fighter, puts her own life on the line to save Mal and that’s when her life changes. I was in love with this book from page one. It might’ve been because of all the Russian-like language, but mostly it was because this book was amazing. The story progresses fast, full of twist, turns, and self discovery. Alina is a strong character who has to learn how to deal with her new found power and everything that is expected of her. She is pulled into the world of The Darkling, a mysterious powerful being who sweeps her off her feet. He’s a very interesting character. I enjoyed discovering more about him and watching his interaction with Alina. Mal, oh Mal. He’s one swoon worthy individual! I loved his relationship with Alina, I loved his character, I loved him to pieces. Leigh does such a good job in writing these two together, their journey, their relationship. If I were to tell you just how much I adore this book, this review will be a mile long. Seriously, I’m recommending this book to people on the street, shouting about it out of my car on the way to work, throwing things at people to get their attention. Well, maybe not but I love this book! I have so many feelings it requires a gif (or two)!!! Leigh created such a beautifully broken world, with characters who take a stand and fight for what they believe in. This book will literally keep you up at night and stay with you long after the last page is read. This book comes out June 5th, 2012. Buy it, read it, love it! ← Book Haul Galore with Lots of Awesome! I've heard so many good things about this. Can't wait to read it. I've heard this book is fantastic, but honestly haven't paid much attention to it. I have to say, your review makes a great case for it. I may give it a go at some point. I sort of lost my train of thought after seeing the Supernatural gif. The ARC I got in April has a different cover, so I wonder if they've changed it! I kind of like this one better. Sounds like a great book! I loved this one too. I haven't read too many negative comments about it — seems like everyone is on board! Can't wait for the next one! When I first heard of Shadow and Bone I knew it was a book I had to read. It just sounded so good and I was especially excited about the Russian influence. I am very happy that this novel did not disappoint. I did have some minor issues but overall it was a fantastic start to the Grisha trilogy and I cannot wait for the next book.